Geographical variation: Three subspecies are recognized: S. c. suratensis, S. c. chinensis and S. c. tigrina. New Zealand birds are of the subspecies tigrina. 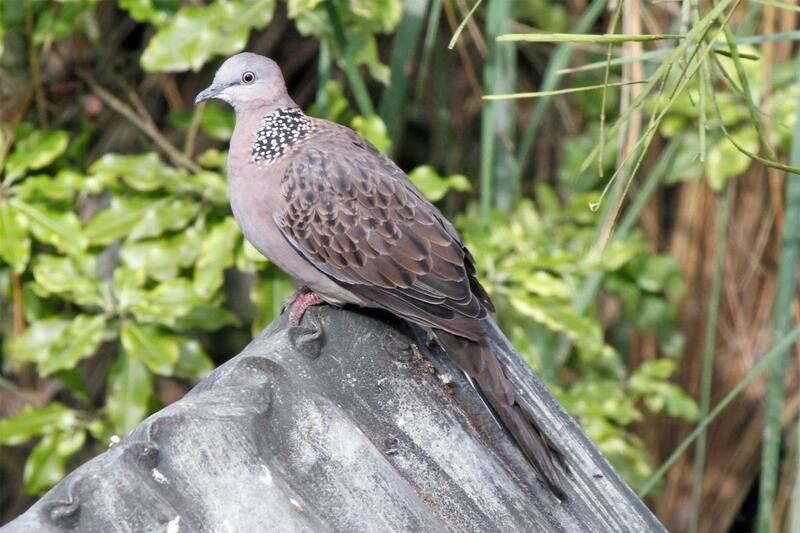 A native of south and south-east Asia, the spotted dove was introduced to New Zealand in the 1920s, when some were released from captivity in Mt Eden, Auckland. No doubt this population has been supplemented periodically by other releases and escapes from captivity. 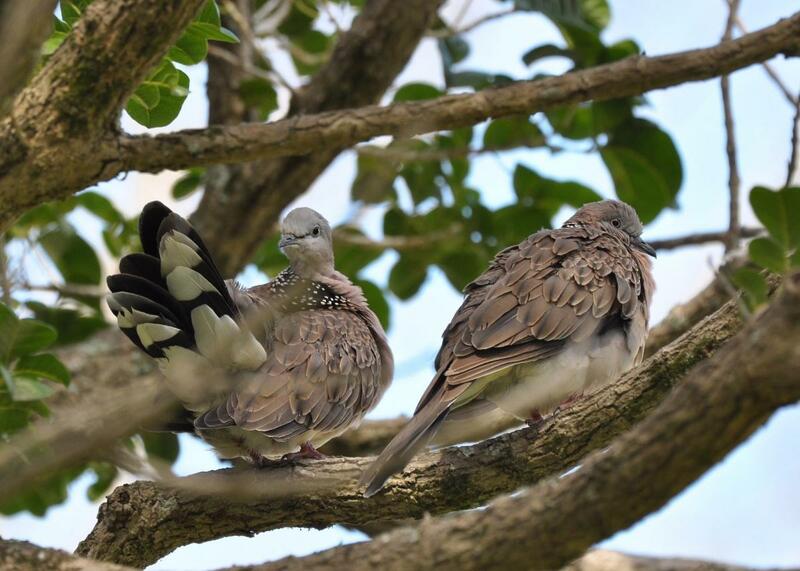 Recent molecular genetic studies suggest that this species and the African laughing dove form a distinct group within the genus Streptopelia, leading some authorities to put them in a separate genus, Stigmatopelia. 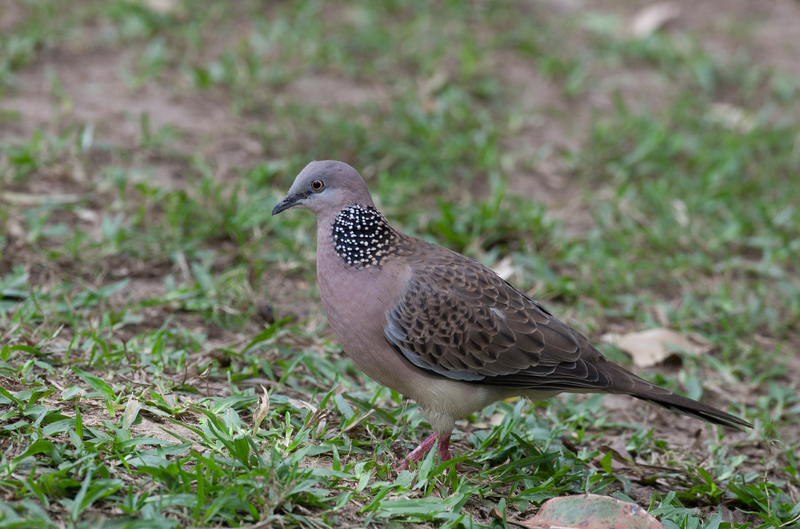 The spotted dove is a medium-sized, somewhat long-tailed dove with a greyish head, pink-grey underparts, and speckled greyish brown upperparts. Its distinguishing feature is a large white-spotted black half-collar around the back and sides of the neck. The main flight feathers are dark grey, faintly tinged brown. Wing coverts, tertiaries, scapulars and upper back feathers are brownish grey with pale tips and dark centres, creating a speckled appearance. The central tail feathers and long upper tail coverts are brown, while the outer tail feathers are dark grey, the three outermost ones having white tips. The amount of white increases towards the outside of the tail; on the last feather it covers up to one-third of the total length. The legs are deep pink, and the iris red. The sexes are alike, although females are smaller with a less strikingly marked neck patch. Juveniles lack the prominent domino neck patch; their wing coverts and scapulars have pale brown edges; and the iris is brown-yellow. Voice: a deep, slightly lilting coo corrr cuk, the inflection of each syllable rising slightly then falling. This 3-second phrase is repeated over and again, for minutes at a time. 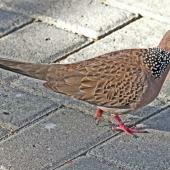 Similar species: Barbary dove is smaller, paler, and distinguished by having a black half-collar on the neck, rather than a white-spotted black neck patch. Rock pigeon is larger, stockier and generally much darker grey. 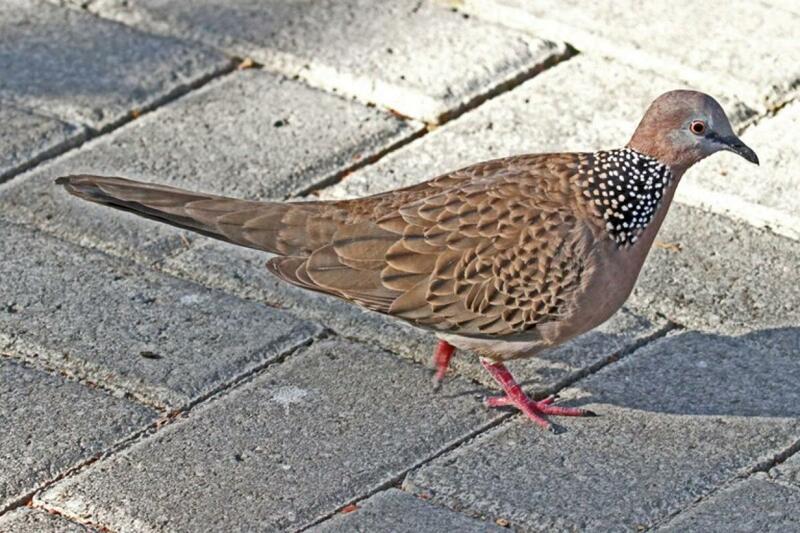 Spotted doves are known to hybridise with both species. The 1999-2004 Bird Atlas survey, and current records in eBird New Zealand show spotted doves occurring widely from Whangarei south to Hamilton, and in coastal Bay of Plenty between Katikati and Whakatane. The few records outside these areas are either birds seen in animal parks or ones likely to have been released or escaped from captivity. There were no records from the South Island. Spotted doves occur mainly in urban parks and gardens. In its native range, the species occurs in moist open forests, woodland, cultivated areas, and around human settlement. Spotted doves were reported from just 3.1 % of the 3192 10-km grid squares during the 1999-2004 Bird Atlas survey, and in only 1.1% of 31,672 record sheets. In the 2012 winter Garden Bird survey, spotted doves were recorded in 4.9 % of the 3683 data sheets; on average, just over 4 birds were noted on each occasion. Reports of the species’ occurrence around Auckland from 1950 to mid-1980s indicate a rate of radial expansion in its range of just under 2 km per year. 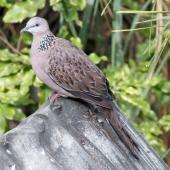 Spotted doves are not known to have any significant negative ecological or economic impacts. Small flocks may gather to feed on spilled grain or harvest leftovers. Spotted doves breed primarily in spring and summer, but can breed at other times of the year if there is sufficient food and mild weather. The nest is a shallow platform of twigs, usually placed above 3 m in a tree or bush, or even in structures such as disused railway stock wagons. The 2 eggs are incubated by both sexes. Nestlings are semi-altricial, covered at first with wispy down and brooded and fed by both parents, initially with a secretion called ‘crop milk’. Once the feathers begin to develop, the chicks are brooded less, and are fed regurgitated seed. More than one brood can be raised in a season. Spotted doves occur mostly in pairs or small flocks, foraging on the ground and perching in trees or on overhead telephone wires. Their flight is rapid, powerful and direct, but birds leaving a perch to forage on the ground often glide down quietly. Males have an aerial advertising display in which they fly steeply and noisily up to 20-30 m before turning and gliding on stiffly spread wings and tail down to their perch. Courting males perform an exaggerated bow, first raising themselves up, filling their air sacs, then bowing down, expelling the air while calling loudly cu-coo coorrr. At other times, a bird will sit and call cuk cuk coorrr from a perch, this call being softer and less insistent than that given during the bow-coo display. Both sexes give this perch-coo call, but the female’s call is quieter. Mated birds preen each other (allopreening), especially around the head and neck. Aggressive behaviour normally includes a threatening kirr call, but this can escalate into physical confrontation involving wing slapping. Spotted doves forage on the ground in grassland, cultivated areas and around homesteads, feeding on the seeds of grasses, cereals, small herbs and fallen seeds. Birds will occasionally reach up and strip seeds from growing plants. In the tropics they have been seen eating termites, and so may take insects occasionally. Irwin, M.R. ; Cumley, R.W. 1945. 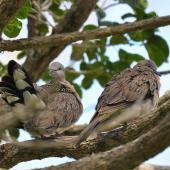 Suggestive evidence for duplicate genes in a species hybrid in doves. Genetics 30: 363-375. Robertson, C.J.R. ; Hyvönen, P.; Fraser, M.J.; Pickard, C.R. 2007. Atlas of bird distribution in New Zealand 1999-2004. Ornithological Society of New Zealand, Inc., Wellington. A medium-sized, long-tailed dove with a greyish head, pink-grey underparts, speckled greyish brown upperparts and a large white-spotted black half-collar around the back and sides of the neck. The legs are deep pink, and the iris red.